Bringing the taste and flair of the south, some of our favorite Executive Chefs are serving up wholesome dishes that will bring any diner back to their southern roots, including Molly B’s Fried Chicken, TWO urban licks’ Hush Puppies, Bistro Off Broad’s Bistro Burger, Dantanna’s Smoked Gouda Mac N’ Cheese and Bully Boy’s BBQ Georgia White Shrimp. When it comes National Southern Food Day, Molly B’s has the lunch rush covered. Served with mac and cheese, collard greens and spicy honey, Molly B’s Fried Chicken will have diners ready to take a nap after lunch. Located inside the Mercedes Benz Stadium on Concourse 100 just inside Gate 2 and near the base of the LED wrapped 10-story mega column, Molly B’s is open for lunch daily on non-event days from 11 a.m. to 2:30 p.m. For more information, visit www.mollybsatlanta.com. Stay connected on Instagram and Twitter at @mollybsatlanta and on Facebook at www.facebook.com/MollyBsAtlanta. 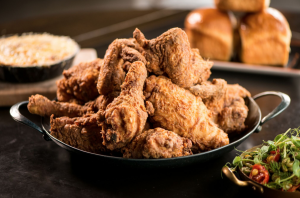 Diners with a taste for fiery American cooking are invited to celebrate National Southern Food Day at TWO urban licks. 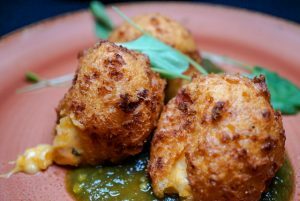 Offering a sweet, yet savory twist on the infamous hush puppy, TWO’s delectable Hush Puppies created by Executive Chef Michael Bertozzi, are comfortably stuffed with sweet corn, chili mayoli, lime, cilantro and cotija. Located at 820 Ralph McGill Boulevard in Atlanta, GA, TWO serves dinner seven nights per week and brunch on Saturday and Sunday. For reservations and more information, call 404.522.4622 or visit www.twourbanlicks.com. Stay connected on Twitter at @2urbanlicks and Instagram at @twourbanlicks and on Facebook at https://www.facebook.com/TwoUrbanLicks/. Combining casual chic, historic elegance and delicious bites, foodies in search of a comfort food staple can venture outside of the perimeter to Winder for Bistro off Broad’s Bistro Burger in honor of National Southern Food Day. 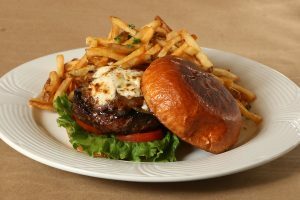 Created by Executive Chef Alex Friedman, the Bistro Burger features an 8oz. angus burger, caramelized onions, boursin and served with house cut fries. Located at 16 E. Candler Street in Winder, GA, the Bistro is open for lunch and dinner on Tuesday through Friday. For more information, call 678.963.5517 or visit www.bistrooffbroad.com. Stay connected on Twitter and Instagram at @bistrobroad and on Facebook at https://www.facebook.com/Bistro-Off-Broad-129399941013597/. 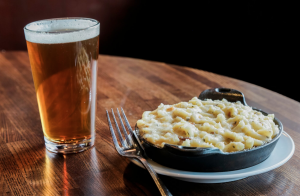 Available at Dantanna’s Downtown and Buckhead, the Smoked Gouda Mac N’ Cheese with herb infused fresh cream is the perfect way foodies can cozy up to National Southern Food Day. Diners searching for the ultimate comfort food experience can add lobster or bacon for an additional charge. Dantanna’s Downtown is located at 1 CNN Center #269, Atlanta, GA 30303, and Dantanna’s Buckhead is located at the Shops Around Lenox, 3400 Around Lenox Rd NE #304, Atlanta, GA 30326. For more information, visit www.dantannas.com or call 404.705.8873. Stay connected on Twitter and Instagram at @dantannas and on Facebook at https://www.facebook.com/dantannas/. Fresh from the east coast, Bully Boy’s BBQ Georgia White Shrimp is the quintessential dish for diners to experience a taste of the south this National Southern Food Day. 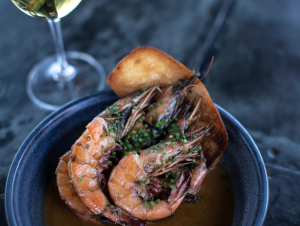 Created by Executive Chef Michael Bertozzi, the BBQ Georgia White Shrimp is served with lemon, Tabasco and an Old Bay crouton. Bully Boy is located at 828 W10 Ralph McGill Blvd, Atlanta, Georgia 30306 and open Sunday and Monday from 5 p.m. to 10 p.m., Tuesday through Thursday from 5 p.m. to 11 p.m. and Friday and Saturday from 5 p.m. to 12 a.m. For more information on Concentrics Restaurants please visit www.bullyboyatl.com and www.concentricsrestaurants.com or call 678.904.5607. Stay connected on Twitter and Instagram at @bullyboyatl and on Facebook at www.facebook.com/BullyBoyATL.